It seems like I have fallen into a heavy rotation of posts about the weather, or at least, heavier than what I’ve normally referenced since starting this blog so many years ago. Living in the country with acres to tend and animals to care for has a way of amplifying the significance of the weather, particularly when the conditions are extreme or out of the ordinary. As we enter the last week of April, finally having warm sunshine be the order of the day is unleashing a sense of urgency for getting into the outdoor spring chores. 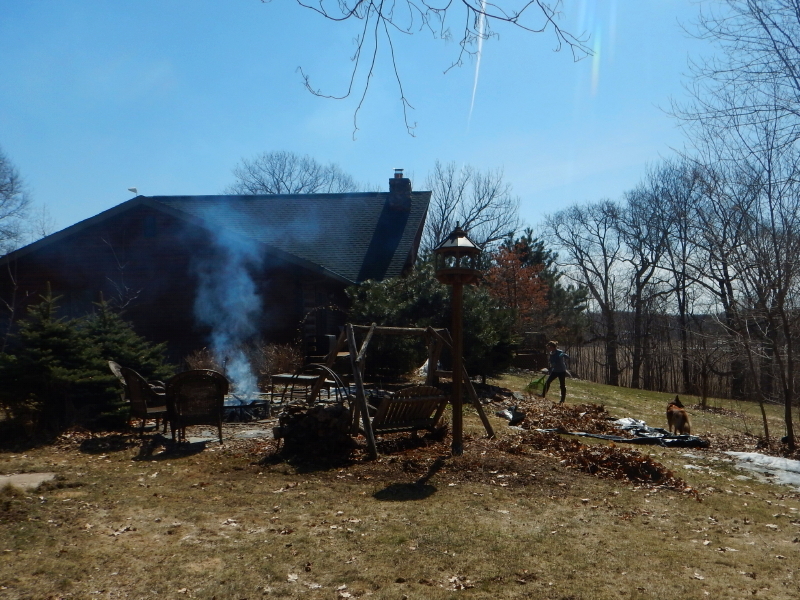 We started first thing in the morning yesterday, building a fire outside to burn combustibles from Friday’s garage clean-up that didn’t fit in our trash bin. While we were out on that side of the house, we also moved all our outdoor furniture back on the deck, trimmed shrubs, and raked around the landscaping. The afternoon was focused on the labyrinth. Cyndie did some plant pruning and raking, while I busied myself with reorienting and balancing rocks that had been felled by the long winter. I was in the woods, digging up some additional rocks, I felt something on my eyebrow that I thought was debris that had kicked up, but when it didn’t just brush away with the back of my gloved hand, I paused. Removing my glove to better reach behind my sunglasses, my bare fingers were able to extricate a tiny tick. Most likely, a deer tick. At least it’s finally nice outside.